On Sunday the family went out to my hometown for the parade that precedes the fair. The fair comes to town every year around this time and going to the parade is part of the experience. Leading up to the parade the kids already had a full day. For lunch we took advantage of the unseasonably great weather and ate at a local park. Mom and I had Subway sandwiches, Alyce had a peanut butter and jelly sandwich or as she likes to call it a "jelly sammich", and Luke had Similac soy formula (yum). 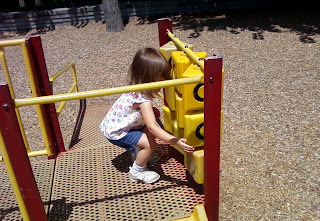 After lunch Mom and I took turns watching Alyce as she took turns on the play ground equipment. 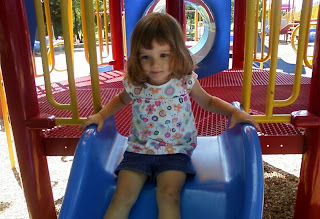 Alyce rode on some slides, climbed through tunnels, swung on the swings, climbed ladders, and for the first time rode a merry-go-round. Alyce didn't ride the biggest slides. She tried but upon sitting at the top she said they were too hot and didn't try again. I can't blame her, the slides were warm and I'm glad that she made a decision based upon information (feeling the slide). While one of us was with Alyce the other was with Luke. Luke had a pretty good time at the park too. While we were eating Luke was in his car seat looking up at the sky through the shade trees above us. After some lunch he drifted in and out of sleep enjoying the cool breeze in his car seat. Two hours at the park then we had to get the kids off for a nap in order to go to the parade later. 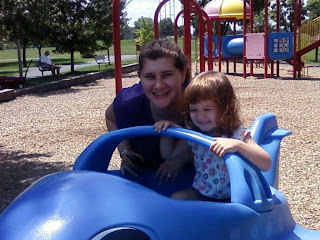 Mom and I really enjoyed the leisurely Sunday all thanks to an empty schedule and great weather. The Magic Number is 5!